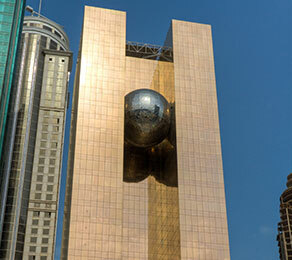 Offering 39,000 m2 of office space and 10,000 m2 of parking, the Al Dana Tower is a groundbreaking structure with a breathtaking spherical conference room in the shape of a Gulf pearl, anchored at only two points and suspended at the centre of the building on the 20th floor. Societe d’Entreprise et de Gestion, the main contractor, commissioned CCL to deliver the post-tensioning element of this project. As a result of the longer spans and thinner slabs achieved by the use of its system, CCL was able to propose the addition of two extra floors to the project, without increasing the overall building height or compromising Qatar Municipality building zone requirements. The extra floors were created by replacing the 600mm reinforced concrete drop beams with a 200mm solid post-tensioned flat slab. CCL, because of its unique systems and bespoke design, was able to offer innovative solutions to overcome several problems on site, ensuring faster progress than would have been possible using conventional reinforced concrete slabs. Construction of the Al Dana Tower began during the preparation works for the 2006 Asian Games in Doha. The vast amount of building projects in the city at this time led to a local shortage of materials. CCL was able to overcome this problem and maintain an uninterrupted supply of materials to site.